Sure, you want to maintain a healthy weight, but arthritis in your joints may make it painful – or even dangerous – to participate in some types of exercise. Your body is supported by a machine or water. Your orthopedic doctor may recommend low-impact exercises if you have arthritis, osteoporosis or bone, joint or connective tissue injuries. By doing these exercises like these, you’ll be able to stay in shape while preventing pain or injury to your joints. Here are some of the best low-impact exercises along with the number of calories they can burn. Swimming is a great exercise because it works all your muscle groups, but the water supports your body and eliminates stress on your joints. You can really burn some calories, too. If you swim at a steady, moderate pace for 45 minutes, you’ll burn 333 calories. But don’t push yourself too hard in the beginning. Start by swimming 20 or 30 minutes and work your way to up to longer swimming sessions. If swimming isn’t right for you, try a water aerobics class. An instructor will lead you through a series of low-impact exercises to tone muscle and use up calories. Walking is perhaps the most popular low-impact exercise since you don’t have to join a gym or invest in equipment. All you need is a pair of supportive walking shoes. Walking also uses many of the body’s muscle groups while putting very little stress on your joints. And you’ll expend more calories than you might think. An average weight person walking at relatively brisk 3.5 MPH on a level surface will burn about 200 calories. Ride a bike outside to enjoy the fresh air or join a spinning class when the weather doesn’t cooperate. You’ll be glad you did, too. Cycling for 45 minutes at a brisk pace will burn about 380 calories. 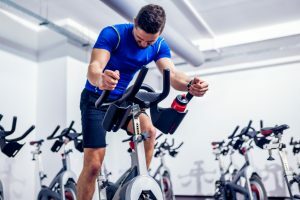 Be aware that some spin classes can be intense so beginners might want to stick to a stationary bike at first. The smooth motion of an elliptical trainer reduces the impact on your joints while letting you burn about 350 calories in 45 minutes. Find a model with an upper body component to make the most of your exercise. Got questions about exercising safely? Contact physical medicine and rehabilitation specialists for help.